The Mookambika shrine at Kollur is one of the most revered pilgrimage centers in Karnataka (and in Kerala). It is located at a distance of 147 km from Mangalore. The nearest railhead is Udupi, and it is well connected with tourist centers such as Mangalore and Shimoga in Karnataka and Kannanur in Kerala. Located in very picturesque surroundings, Kollur is on the banks of the river Sauparnika (said to possess medicinal properties) at the foot of the hill Kudashadri. The temple is located in a spacious courtyard, and is entered through the eastern gopuradwara. The western entrance, is opened only on special occasions. It is believed that Aadi Sankara entered the temple through the western entrance. Kollur is regarded as one of the Seven Muktistala pilgrimage sites in Karnataka which are (Kollur), Udupi, Subrahmanya, Kumbasi, Kodeshwara, Sankaranarayana and Gokarna. While the other pilgrimages created by Parashurama are devoted to Lord Shiva, Lord Subramanya and Lord Ganesha, this is the only one devoted to goddess Parvathi. Kollur i s known for its association with Aadi Shankara. 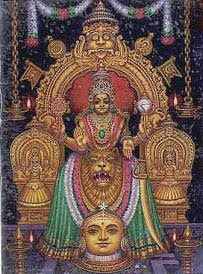 Mookambika is said to have appeared before Aadi Sankara here, and he is said to have installed her image at this shrine. There is a room near the sanctum - enshrining the Sankara Simhasanam which is regarded as the very spot where he meditated and had a vision of Mookambika. Mookambika is regarded as a manifestation of Shakti, Saraswathi and Mahalakshmi. The Kudashadri hill houses sites such as Ambavanam and Chitramoolam where Adi Sankara is believed to have meditated. The image of Mookambika is in a seated posture, bearing the conch and the discus. Also enshrined near this image are those of Mahakali and Saraswathi. The main statue in the temple is the Shiva linga called the Jyothirlingam. 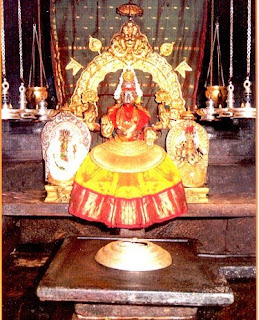 This Jyotirlingam in front of the image of the Goddess Mookambika is of great antiquity was installed by Shankara. A golden line divides this lingam into two unequal parts and is visible only in the light of reflected sunlight pointed at the lingam. The right portion of this lingam is said to represent Brahma, Vishnu and Shiva - as the conscious static principles and the larger left part Lakshmi, Saraswathi and Parvathi - the creative energy principles. It is a belief that the three goddess Lakshmi, Saraswathi, Parvathi and the three lords Brahma, Vishnu and Maheshwara emerged out of it. There are also shrines to Veerabhadra, Subramanya, Naga, Vinayaka and Anjaneya. Veerabhadra is worshipped first by devotees before entering the shrine to Mookambika. Rani Chennamma, the feudal lord by name Halugallu Veera Sangayya has covered the inside of the temple with stone. When we look at the temple structure, we find the sanctorum, then entrance hall and then the Lakshmi Mantapa. There are four pillars at Lakshmi Mantapa and on upper portion of each of these pillars, we find beautifully carved images of various gods. Prominently, they have sculpted the images of Ganesha, Subrahmanya, Naga, Mahishasura Mardini and the goddess in different postures as delineated in Devi Mahatma. Earlier, this made up the total temple structure and the outer prakara was not present. So Veera Sangayya also took up the prakara, as per the principles of temple architecture. We may also find beautiful images of Ganapathi atop the doors situated at the entrance to Garbhagriha, Lakshmi Mantapa and the Mukhya Dwara (main entrance). It is normal practice in any temple to depict the main deity over the entrance, and the fact that all three doors carry the carvings of Ganesha is considered to be of special significance. There are many inscriptions at Kodachadri that relate the tale of time. The Prakaras, which underwent renovation from time to time, hold a mirror to the changing mores in architecture during bygone cultures. Specifically the Vaasthu of Garbhagriha structure is very ancient and extraordinary. The Garbhagriha is single yoni flag size (Eka yoni pramana dwaja aya). Pre entrance has a three flag proportion and is about 3½ feet wide and 12 feet long. Lakshmi Mantapa measures 134'. 11". Then comes the prakara. Beyond that, is Navaranga Mantapa. Outside the temple is a large and beautiful Deepa Sthambha ( a pillar to hold lamps). This has 21 concentric circles in which the lamps can be lighted, and when viewed from Kodachadri, one would feel as though we were looking at the Divine Makara Jyothi at Lord Manikanta's Shabarimale. This beautiful Deepa Sthambha rests on a Koorma Peeta (seat with tortoise head); on this tortoise is a huge elephant upon which Lord Ganapathi is astride, looking westward and facing Goddess Mookambika Devi. During Navarathri, and during the Rathotsava on Phalghuni Masa Krishna Paksha Ashtami day (the day after Holi), the age-old practice of starting the pooja by praying to Lord Ganesha present on the pillar is kept up even today. In the inner corridor, just beyond the Garbhagriha, as we move around the shrine in a pradakshina, we will find totally four different idols of Ganapathi being worshipped, beginning with the Dashabhuja Ganapathi. Of these, the Balamuri Ganapathi idol that is made of white marble is beautiful and high of significance. Then we have the image of serpent which has formed on the stone in the south-west corner. It is believed that, as we move in pradakshina, if we touch this serpent and offer our prayers, it results in several benefits, like warding of Sarpadosha, averting all doshas, and most importantly, acquiring good fortune. 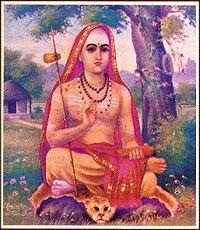 Then we see the Shankara Peeta, where Adi Shankara Bhagavathpada meditated, and by virtue of his ascetic powers, visualized the form of Devi in all totality and realized the Devi herself. As we move in a pradakshina at the outer enclosure, we first find Subrahmanya swamy, then Saraswathi and then Pranalingeshwara, Partheshwara, the deity of Mukhya Prana (with a bell on the tail) installed by Vadiraja, Vishnu Brindavana, a beautiful idol of Gopalakrishna within the Brindaana (Considered as upa-pradhana Devatha), the platform for Tulasi and then the temple of Veerabhadraswamy who is the presiding deity. Entrance to this shrine being made of wood, we may see an excellent image, of Nrutya Ganapathi, right at the centre of the arch. It is said that the deity of Mukhya Prana has been situated right opposite the Veerabhadraswamy shrine with a view to balance its frightful appearance. The two rivers Agnithirtha & Sowparnika which flow in the sanctuary of mookambika descend from Kodachadri hills. The wee spring of cool water situated in between the temples of Kalabhairava and Umamaheshwara is the source of river Sowparnika. Legend says that Suparna (Garuda) did a penance on the banks of this river praying to the Goddess for the abatement of his mother Vinutha's sorrows. When the Goddess appeared before him, he prayed that the river be henceforth known after him, Suparna, and therefore came to be called as Sowparnika. At the location where he is said to have sat in penance, there is a small cave even today which is known as "Garuda's Cave". Mookambika Wildlife Sanctuary is world Wildlife Fund Aided. This s anctuary is home for endangered species animal called Lion tailed monkey. Spread along the Kundapur-Kollur- Shimoga road, this sanctuary is generally off the tourist map. One route is via Tallur-Hattiangadi-Karkunje-Vandse. Second route via Hemmadi-Vandse and third one is via Byndoor. However, the shortest route is through Hemmady. On the National Highway 17, after around 7 km from Kundapur, at Hemmady one has to take right deviation to reach Kollur. The nearest railway station is Kundapura (40 km) where a few long-distance trains halt. You can get taxis from the station. The station has a waiting room for the passengers. The nearest Airport is Mangalore International Airport ( Bajpe )There are pre-paid taxi to kollur from Airport and it is a 3 hours drive or approximately 150 kilometer. well researched. beautifully yet simply written.